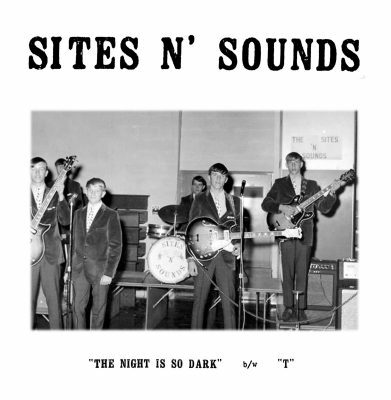 In the midst of the dark and uncertain shroud of 1960s garage rock unknowns come Sites N’ Sounds. Unearthed in 2016, these recordings shed light on what Crypt Records’ Tim Warren declared an “unknown monster mooder.” Originally, this record came out in 1967. Sites N’ Sounds were Kennard-Dale High School students from Delta, Pennsylvania, and they played all over from Baltimore to Hershey. They were even featured on Baltimore’s Kerby Scott TV program. Like the folks from Slovenly and Black Gladiator, after dropping the needle on this single, I think I listened to it over a hundred times. The sounds emanating from the A-side germinated inside my mind. This experience was akin to being slowly swallowed whole by music sung by the likes of sirens or, in this case, a teenage garage rock group founded in 1966. “The Night Is So Dark” is an agitated ballad lamenting the uncertainty of a path shadowed by love. It’s haunting, if not a bit whiney. Overall, though, it’s a punchy kind of tune thanks to the provoking drum beat and spooky keyboards. This track drives the feeling of love-lost insecurity home in true teenage garage punk fashion. Unlike songs of teenage love that are mass-produced in today’s sugar-filled forms, Sites N’ Sounds are among the originals to give voice to a deep feeling. Love is complicated and defined by struggle, but its feeling, when fully realized, shines a bright light against any lingering question of validity in that special someone’s eyes. Sites N’ Sounds—much like others of that generation—offer a raw, rock n’ roll ballad to beautifully celebrate these feelings. The importance of finds like this Sites N’ Sounds single are immense and profound. It’s music from an era largely looked to for bands like The Beatles and The Rolling Stones, who are undoubtedly important, but the bands that sprung up like teenage beat weeds deserve recognition too. Sites N’ Sounds heard something that truly spoke to them and then bravely set out to express themselves in a way that no one had really done so before.